Strategic content marketing and corporate communications can help increase sales, strengthen brands, and generate buzz. waveSpawn understands the complex issues companies face in creating visibility and awareness. We know how to launch a product or service, build brand awareness, enhance corporate visibility, and showcase next-level technology. Whether seeking a strategic placement in the Wall Street Journal, a strong presence in vertical markets or expert counsel on shareholder issues, we maintain the ability to exceed your expectations and communication needs. A steady flow of articles, insightful content, and white papers can help to position your company as the expert in your industry. It could be a combination of comments on current events or development updates regarding an upcoming product launch, the objective is to get noticed. As you distribute helpful information, you enable your customers and prospects to easily find you as you stay on their radar. waveSpawn can help you with developing a plan for creating and distributing specialized content. Information that contains keywords that your audience is likely to search for. Whether it’s ghost writing, blogging, press releases, status updates, tweets, etc. we know how to disseminate your messages through the proper social media channels. Our mission is to help you build a trusted community of active participants. 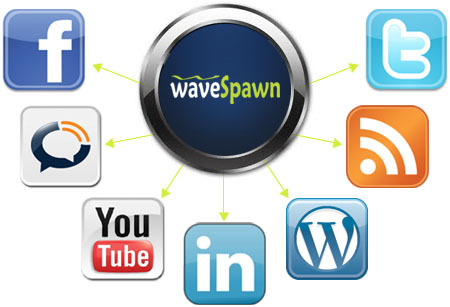 Using analytical tools, waveSpawn will continually monitor and work to strengthen your brand and online presence. We’re here to help you interact with your audience in new and strategic ways.